We are instrumental in manufacturing, exporting and supplying of Paint Curing Oven. We are recognized globally for the excellent quality, durable and cost effective Paint Curing Oven. 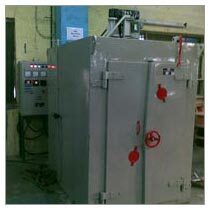 We deal in Paint Curing Oven that is used in various industries. We cater to the ever-evolving demands of the customers by offering customized solutions; thus giving them a variety of options. We make use of cutting-edge technology for the fabrication of Paint Curing Oven.